Its always important that you track the right stats of your marketing campaigns and email marketing is no difference. If you are able to track on things that work and things that don’t work for your campaign it could lead to a dramatic increase in your return of investment. There are few key stats which you should always focus on. This is one of the most common mistake any new website or start-up makes. They do not track the different form of sign-up forms as well as which form produces more sign-up over other. As I am using Aweber I can easily track which of my forms work for me. This is just one example but you can also compare by having different forms in sidebar and see which one works. You may have changing tag-line, changing position and other things. After all the success of your website is determined by the number of subscribers you have in your list. Each time you send a message using Aweber they track opening rate of your messages. The opening ( and probably reading as well ) of your email can be drastically improved by changing your subject to something very catchy. If you have the actual data on which subject line what is your open rate it can help and improve readership of your messages sent over time. Next thing I like about Aweber is they track the clicks on message links and it can help identify reader in a better way, like what they are more keen on reading further. Do they visit the sponsors of the messages and stuffs like that. Aweber has two-way spam avoiding mechanism. First is before you send any email they show you the Spam score by SpamAssassin™ and do not allow you to send email if your Spam Score is not acceptable. If all goes well and you send your message to your subscribers then they track how many emails bounced and also how many had any spam reporting. Any spam reporting is automatically unsubscribed giving you clean list all the time. 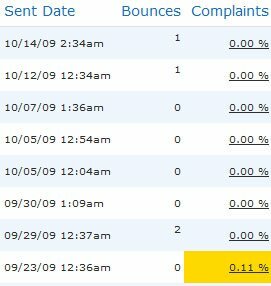 Aweber does not allow complaints of more than 0.1 % which means for every 1000 emails sent they allow maximum 1 reporting. If you can estimate your users location without him doing the hardwork of adding it that helps. In a way that if you have some special offers for some specific geographic location you can send offer to people of that locality and have better return of your effort. Apart from that you can get local advertisement for users or even can show better stats to your advertisers for more targeted campaigns. If your Email Marketing Campaigns cannot track basic stats its time to for you to give Aweber a try for $1 and if you are still not satisfied you can get even the $1 refunded back.